I apologize for not posting for a week! I have been super busy with schoolwork and just everything else going on! 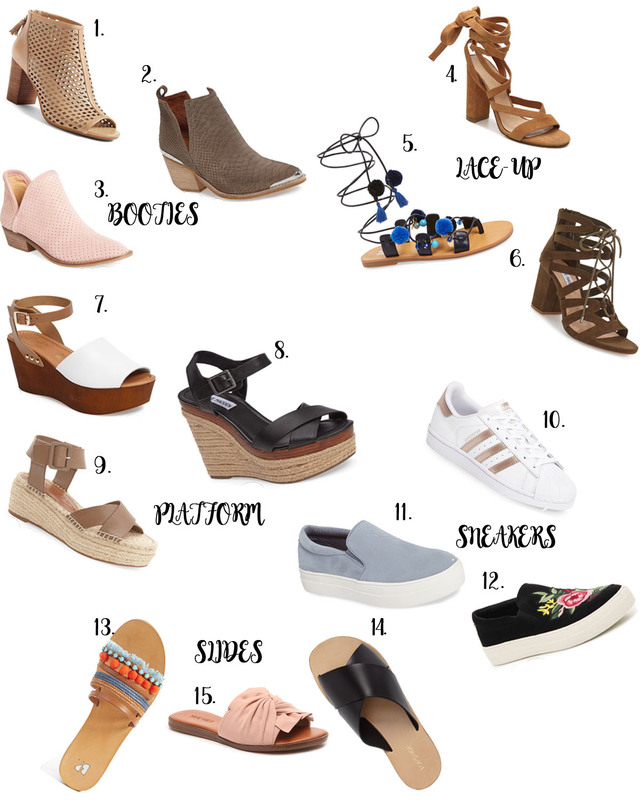 Anyway, there are SO many cute shoe styles out right now, so I went ahead and rounded some for you! I am obsessed with the cute little tassels on the zipper! These are the perfect spring and summer booties! Also come in black! These are too cute! I love the western flair and they come in sooo many other colors, too! These are a great basic bootie! They would go with EVERYTHING!! They come in a few other colors as well! I think the pink is really cute! These shoes have been so popular! They also come in black! How fun are these!? I think they would be super cute for a tropical vacation! These are great basic lace-up's! I have a pair of Steve Madden lace up sandals and love them! These are also available in navy! Love the white on these! The perfect summer platform wedge!! I really want these!! They also come in brown! These have been on my wish list for a while!! They keep selling out of my size though! These superstars are extremely popular right now! They're so cute! Love the light blue color!! These also come in a few other colors as well! Embroidery is huge right now! These are such a fun way to incorporate it into your wardrobe! The tassels and pompoms are so cute on these sandals!! These are really popular right now! I love the crisscross detail! Big bows are really big this season! These come in a couple other colors, too!